Because it is distributed over three passages (Rev 10:5-7; 11:14-19 and Rev 14:6-20), the effect of the seventh trumpet is not readily apparent. Heavenly beings shout out great praise and worship. They proclaim that the kingdom of the world, previously ruled by Satan, has become the kingdom of God and His Son Jesus (Rev 11:15-17). They announce the coming time of judgment of the dead and of rewards for the bond servants, prophets and the saints (Rev 11:18). The heavenly temple of God opens and reveals the ark of His covenant. 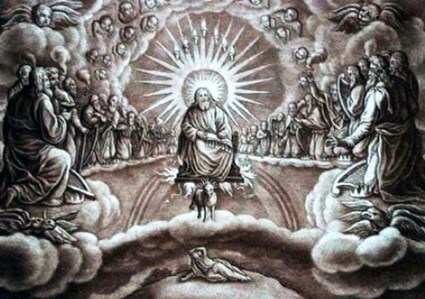 The first angel preaches to the whole world the gospel in a manner that all would understand and have no excuse (Rev 14:6-7; Matt 24:9-14; Mark 13:9-10). The final result of the seventh trumpet is the appearance of the reapers, and the reaping that occurs is in the figurative sense and reminiscent of the Parable of the Tares.